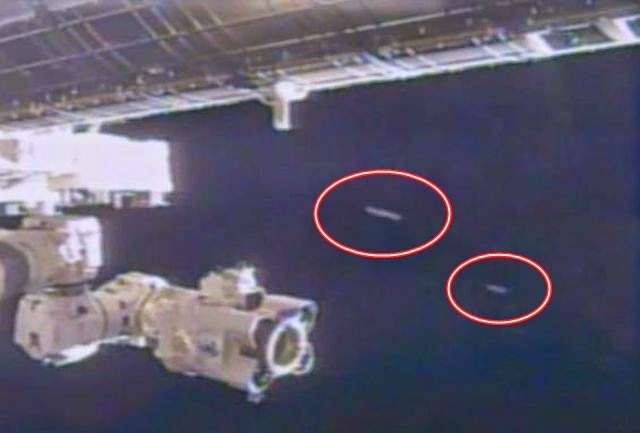 Once again, StreetCap1 caught two cigar-shaped UFOs near the ISS on October 21, 2014. Though the unknown objects are not really clear, this sighting is remarkable as not only there is no chance in light on the screen, thus it could not be a lens reflecting light at a certain angle, but even more important, NASA ended the live feed almost instantly (2-3 seconds) and changed it to another camera. Actually, by ending the live ISS stream so quick, NASA proves that these objects are more than just reflecting lights and as we know the astronauts have to follow NASA’s UFO Protocol there is no doubt they have made clear images of these UFOs.